This is another complex oil, I think of it as kind of like the offensive counterpart to the defensive Fiery Wall of Protection Oil. It’s only used for positive works, though. It’s especially good for adults returning to school and people who run their own businesses, but it can be used in any situation where you desire to succeed. There are a lot of ingredients in it. Mine has more oils than a lot of other rootworkers might use; I don’t like to have a lot of solids in my oils and if I can use the essential oil instead of dried herbs I usually will. I used orange, allspice, cinnamon, geranium, lavender, bergamot, and rosemary oils; you could use dried herbals for the lavender, bergamot, and/or rosemary if you wanted. I added a pinch of anise seed, a small piece of High John the Conqueror root, and a chunk of pyrite. I’ve read of some rootworkers using a pinch of gold glitter, but glitter is made of plastic (sorry to bust your bubble if you thought it was made of unicorn farts) and I only want organic ingredients in my oils. The bottle is from World Market, they have a good selection of small bottles for just $1.99. 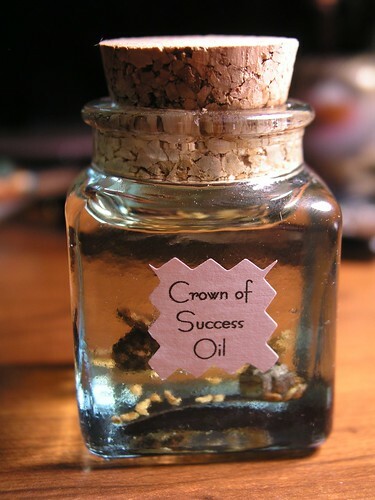 Crown of Success can be used in candle spells (purple would be the right color here), used to dress things like resumes or business cards or school papers (dab a bit on each corner), or used as a personal fragrance. It’s got a really complex, but clean and bright, smell. (I’ve had a bottle of this sitting for about 6 weeks, I’m going to strain out the herbs tomorrow.) 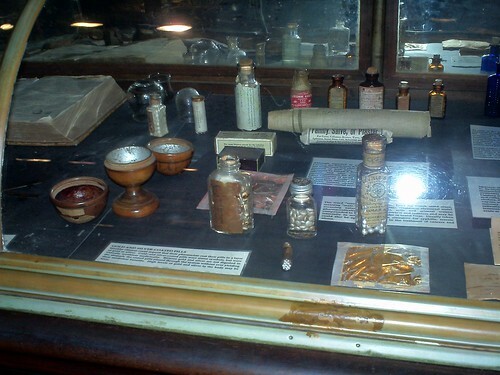 Four Thieves Vinegar is a traditional recipe that supposedly dates back to the days of the Black Death, when its disinfecting/curative properties protected a quartet of Italian grave robbers from contracting the plague. 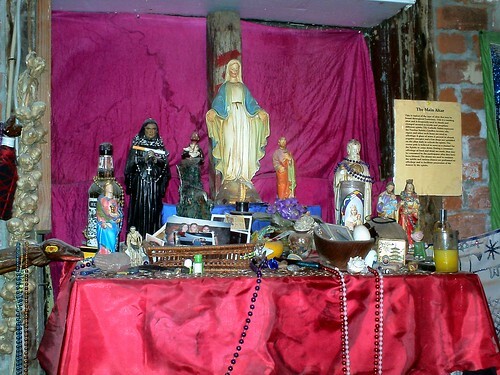 In Hoodoo today it’s used for both crossing (especially if you’re trying to break up a couple) and protective purposes. There is a million ways to make it, but there are 2 basic schools of thought: edible and inedible. 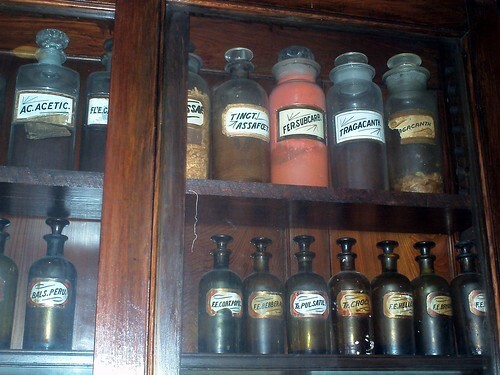 A lot of recipes add inedible herbs and resins like rue and camphor. Me, I don’t see the point of vinegar you can’t drink, so I am firmly Team Edible. 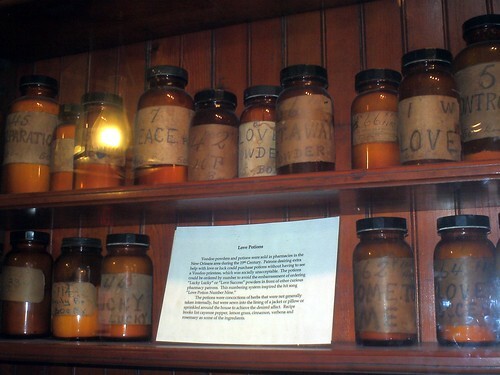 In addition to its spiritual purposes, you can use it for cooking or salad dressing–or you can feed it to someone you want to work on under the guise of cooking or salad dressing. Some people add dozens of ingredients to their vinegar, but the most basic formula is vinegar and 4 herbs (or garlic and 3 herbs)–one for each thief. I use garlic, sage, rosemary, and lavender. 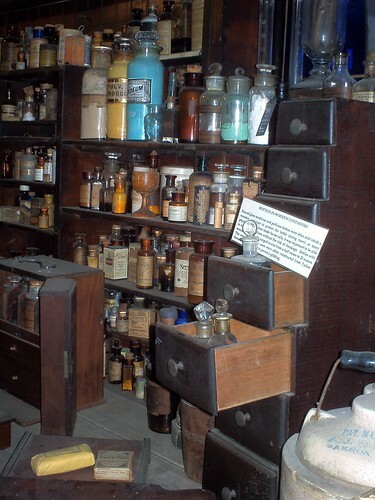 Stuff a bunch of everything in the bottle, pour in the vinegar, cover and put somewhere dark for at least 30 days, shaking daily. Strain out the herbs or leave them in, it’s up to you, and use as needed. 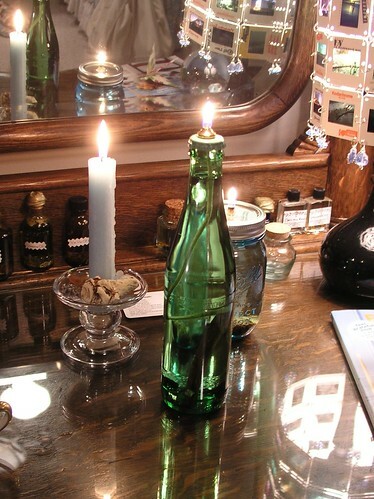 (I strain them out, because the lavender tends to pour out with the vinegar if left in.) It’s delicious, and why anyone would make an inedible version is totally beyond me. I got some sandalwood essential oil I’d ordered in yesterday’s mail, I’m going to use it for Peaceful Home Oil (yes I use it in Peaceful Home Oil even though it’s not standard, more on that later) but I’m still waiting on one last herbal ingredient. 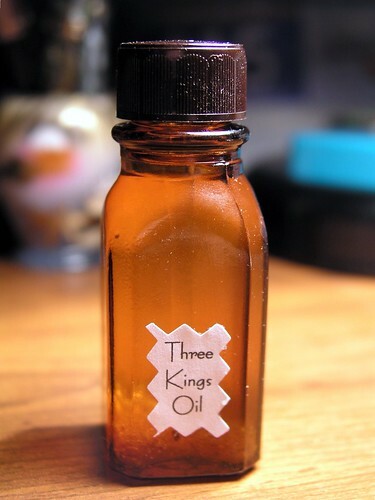 So in the meantime, since I had all the necessary resins, I made some Three Kings Oil. 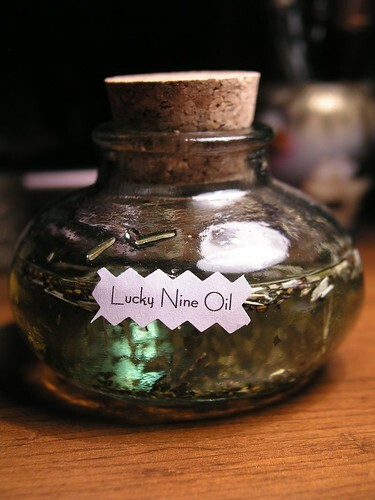 It’s an all-purpose blessing oil, good for consecrating altar items and dressing altar candles (most altars usually have 2 white candles at the back, one on each side). Three Kings Oil is sandalwood, frankincense, myrrh, and amber. You can use essential oils for all 4 ingredients, or use all solids, or use a combination, which is what I did. I crushed up small pieces of the resins* in my mortar and pestle, and added some sandalwood essential oil. You can see the crushed resins resting on the bottom of the bottle, but they will eventually dissolve. *We had a conversation about resins in one of my Facebook groups the other day, to crush or not to crush. Sometimes oil recipes will specify this or that resin be added whole, but more often than not it doesn’t say one way or the other. I crushed all these up, since they are the main–indeed, almost the only–ingredients in the oil. Ultimately, a whole piece of resin will eventually dissolve though, so the conclusion was that it doesn’t much matter one way or the other. Some rootworkers crush, some don’t, some both crush and add a whole piece for show, and still others use resin oils. This is a really simple, classic Conjure oil that I threw together yesterday. Special Oil No. 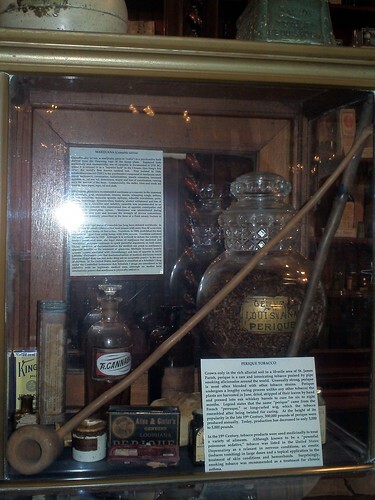 20 (sometimes called Wick Oil, Candle Oil, or Brown Oil) is patchouli and vanilla. 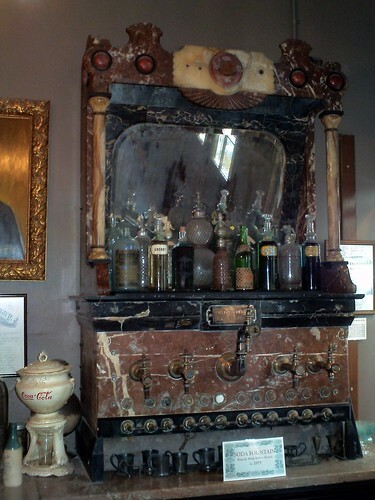 In the old days it was made with patchouli leaves and vanilla pods, which is how it got its brown color; nowadays it’s more commonly made with essential oils and dyed brown. 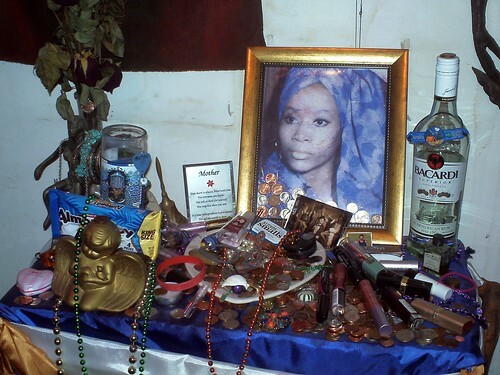 Vanilla is one of the most positive scents in Hoodoo, it encourages love–one of the simplest and most popular Hoodoo spells is to keep a vanilla pod in the family sugar bowl. 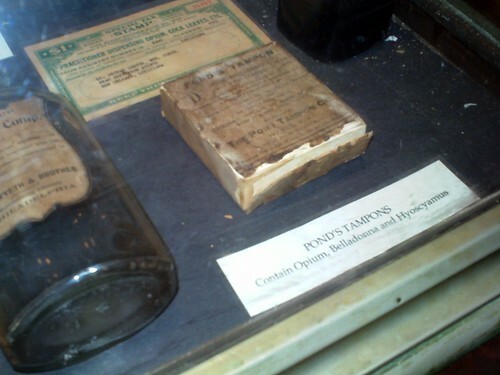 And patchouli is one of the most versatile scents, used to draw both love and money and to break jinxes, so it’s almost always found in “multi-purpose” oils. 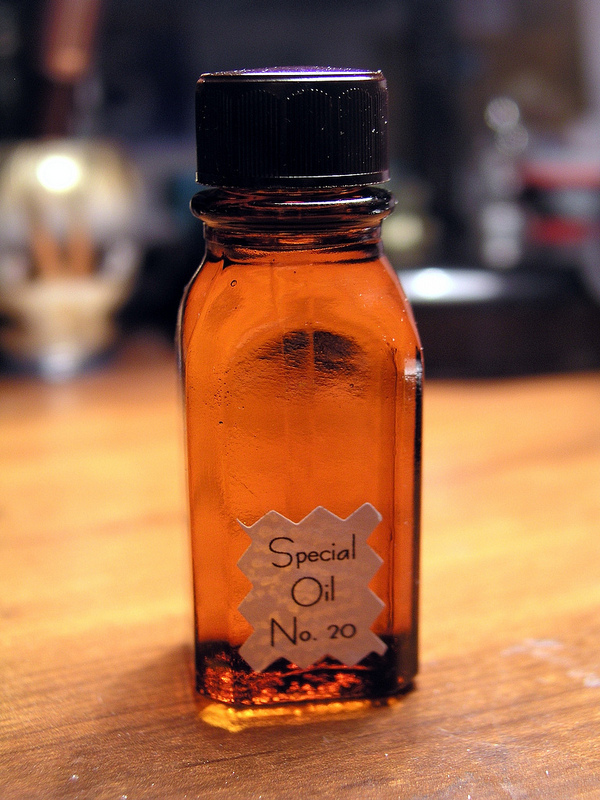 Therefore, Special Oil No. 20 is appropriate for use in any positive or defensive workings. But not “left-handed”* work! 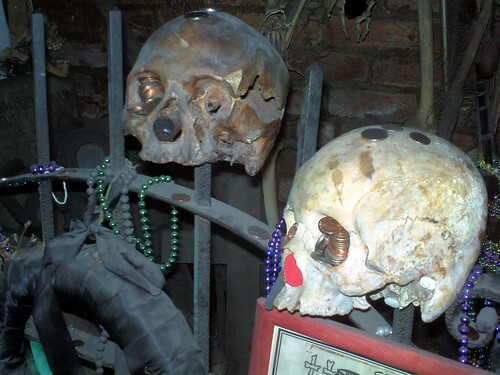 *One of the most striking differences between Hoodoo and Wicca is that Hoodoo has no equivalent to Wicca’s “Rule of Three”. 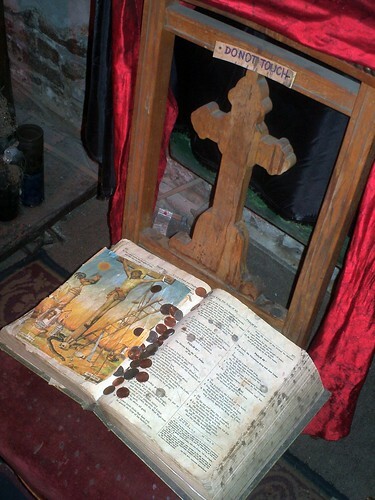 Hoodoo is a belief system of poor and marginalized people who read the Bible if they read nothing else, and anger and revenge–or just needing to get people out of your life–definitely have a place in it.